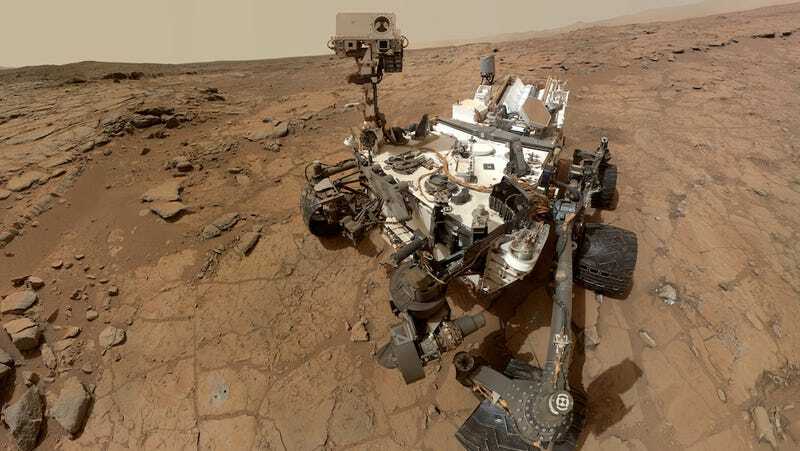 Just when you thought ol' Curiosity was digging in for the winter, the little discovery machine came up with a doozy: It discovered water in Martian soil. NASA scientists just published five papers in Science detailing the experiments that led to the discovery. That's right. There's water on Mars. Impressive as it is, though, the discovery comes with some caveats. It's not like Curiosity stumbled on a lost lake under a mountain or a stream trickling across the landscape. Rather, it found water molecules bound to other minerals in Martian soil. There's kind of a lot of it, too. Researchers say that every cubic foot of Martian soil contains about two pints of liquid water. All things told, about two percent of the Martian soil is made of up water. "We tend to think of Mars as this dry place—to find water fairly easy to get out of the soil at the surface was exciting to me," Laurie Leshin, dean of science at the Rensselaer Polytechnic Institute, told The Guardian. She also explained how the discovery was made. Curiosity picked up and sieved a scoop of soil from the surface before dropping it into an on-board oven. "We heat [the soil] up to 835C and drive off all the volatiles and measure them," she said. "We have a very sensitive way to sniff those and we can detect the water and other things that are released." Of course, this isn't the first sign of water on the red planet. Back in June, Curiosity scooped up a rock specimen that contained a type of clay that can only be formed in neutral water telling scientists that Mars was once home to running water. And of course, scientists have long suspected water once existed on the planet due to various formations across the Martian landscape. In fact, it's widely believed that water existed in abundance on Mars, perhaps just as prominently as it does on Earth. Although we found water bound up in the soil particles, it's still pretty dry. Also, we didn't find evidence of organic molecules in the soil. So, this doesn't have a very big bearing on the life on Mars discussion. However, we now know that our instruments are working beautifully, and our next step is to drill into rocks that may have been better places to preserve evidence or organics and of wet environments that could be suitable for life.